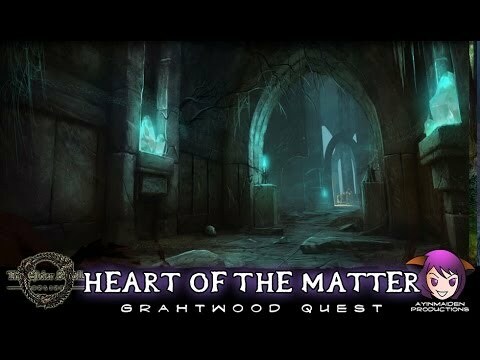 Heart of the Matter is a quest in Elder Scrolls Online. After a harrowing experience at the hands of Magister Gothren, Sun-in-Shadow finds herself at a crossroads—torn between a mage's ambition and the fruits of companionship. Dedicating herself to one may well destroy her chances at the other. Talk to Sun-in-Shadow outside Tel Aruhn tower after finishing The Magister Makes a Move. Meet Sun-in-Shadow at her house and speak to her again. Talk to Eoki at the docks. Go to the Gateway Inn to talk to Atarga. She’s drunk and leaves the room, so talk to Lagdabash instead. Sun-in-Shadow enters the Inn. Talk to her. Find Bothamul near Tel Aruhn and speak with him. Meet and talk to Eoki outside Vassamsi Mine. Deal with the guards and help the slaves escape. Talk to Sun-in-Shadow and help her decide what to do about Eoki. Leave the mine, then talk to Sun-in-Shadow once more. Note: This is one of the quests required to complete ' Fit to Rule'.